Jena is a firm believer that experience is the best teacher. That is the reason why she never takes clinical duties lightly. Yes, she listens attentively in class and studies every night, but for her, nothing else could help her remember and understand nursing concepts than experiencing applying it in the real case scenario. Today, they are assigned at the surgical ward. Though a bit anxious, she is eager to learn about different surgical cases available the ward. Together with their Clinical Instructor, she and her classmates make their rounds, identifying patients and assessing them thereafter. They reach the same bed and while she was glancing at other patients, their CI tells something about penrose and Jackson pratt drains. Wait, what? She looks at the patient who is covered in bandages, has a tube like rubber sticking out from one part of the abdomen and a bulb in the other. “Which is which? Which is the Jackson pratt drain and which one is the penrose drain? And what exactly are they for?” she thinks to herself as she reminds herself to ask their CI later on, after the rounds. The purpose of a drain is to let blood, pus, or other fluids escape from a wound while it heals, without letting bacteria get in. 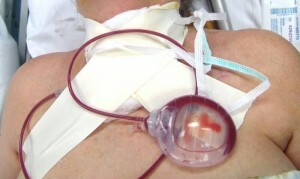 In this case, blood or pus will flow through a tubular drain or round a solid one. The penrose drain, which is the most commonly used drain, is a soft rubber tube placed in a wound area, to prevent the build-up of fluid. In other words, the Penrose drain acts like a straw to pull or drain blood and other fluids from your surgical site and release them outside of your body onto a dressing, to prevent fluids from collecting under your incision. It is made of flexible, soft rubber and causes little tissue reaction and acts by drawing any pus of fluid along its surfaces through the incision or through a stab wound adjacent to the main incision. It has a large safety-pin outside the wound to prevent it from slipping into the wound and to maintain its position. In order to facilitate drainage and healing of tissues from the inside to the outside, the tube is often pulled out and shortened 1-2 inches each day until it falls out. Some things to remember when using penrose drain, are that the safety-pin should be placed in its new position prior to cutting the drain, and after which, advance the drain with dressing forceps or hemostat. You may use surgical scissors to cut excess drain. The drainage amount and color appearing in collection apparatus should also be noted. The Jackson-Pratt drain on the other hand, consists of a flexible plastic bulb that connects to an internal plastic drainage tube. This device is used to pull excess fluid from the body by constant suction. Removing the plug and squeezing the bulb removes air. You can do this by folding the drain in half while it is uncapped, then while folded, recapping the drain. The purpose of a drain is to prevent fluid build-up in a closed space, which may cause either disruption of the wound and the healing process or become an infected abscess. Both scenarios may possibly require a formal drainage or a repair procedure. This drain is also used to evacuate an internal abscess before surgery when an infection already exists. If the drainage tubing become clogged or otherwise clotted off, the benefits are not realized from drainage. Some things to remember when using Jackson-pratt drains is to empty the bulb at least twice a dayand record the amount of fluid collected in the bulb.